There she is. The Lotus Blossom is back up on the needles. 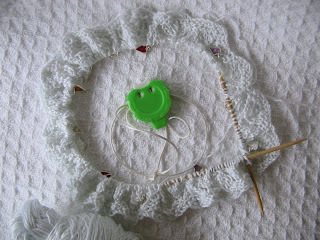 I'm almost finished the first lace repeat - again. I plan to work on this tonight, and maybe a little bit tomorrow, then I'll start that second sock. My niece Thea is coming to visit on Thursday and through the week-end. Working a sock while visiting is far less consuming than that lace. Next week will be full steam ahead. 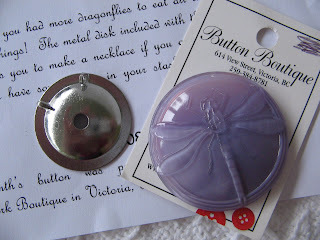 Today the post brought August's button-of-the-month. Another stunner, it's a large (3 cm?) purple glass circle with a dragonfly in the center. Jane also included a backing piece that allows me to change the button into a pendant. I just might do that. Thank you Jane. It's gorgeous. Be careful this time! I like the coulor of the socks. Glad to see you've got the Lotus Blossom going again. I have a suggestion especially since the yarn is so slippery. LIFELINES!!!! every 5 or 10 rows. It's worth it. I think that button is really the July button. I'm sending the August button with Thea.